The bumper on your Toyota Celica serves an important function. 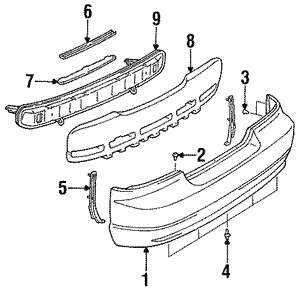 It’s both an appearance piece and a major part of the structure of your Celica. Positioned on the nose of the front end of your Toyota Celica, the bumper finishes off the appearance. In the event of a collision, the bumper provides safety and protection for you as well as the rest of the car. If your Celica's front bumper has been damaged from an accident, the only choice for replacement is an OEM Celica bumper. OEM bumpers have been designed to fit your Celica perfectly. After all, they're an exact replacement for the factory bumper. Cheap aftermarket bumpers are a mistake. They often have fitment issues and cause more trouble than they're worth. When you buy your bumper from Olathe Toyota Parts Center, you’ll get wholesale pricing on all the OEM parts you need. We also provide fast and affordable shipping. There is no reason to settle for less! 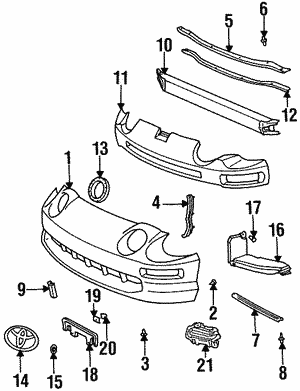 Get your OEM Celica bumper and other OEM Celica parts now!